When preparing to write an opinion, persuasive, or argumentative piece, teachers often ask students to generate a list of reasons to support a position. However, the lists students typically generate are not of reasons, but rather of details. 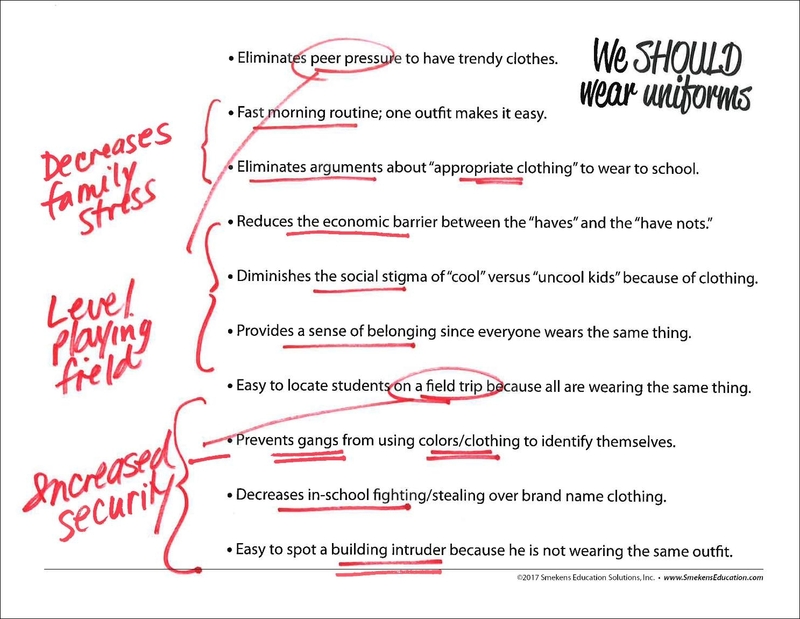 We'd eliminate peer pressure because everybody wouldn't have to wear the trendy clothes. We would have a faster morning routine because you only have one outfit choice. You wouldn't have "cool" versus "uncool kid" stigma because everyone is wearing the same outfit. Kids wouldn't fight over or steal one another's brand name clothing because we're all wearing uniforms. It doesn't matter whether that list was generated by research or personal background knowledge. Either way, it's just a list of details. The fact that the morning routine is faster is a specific detail. There is little else to say. In order to identify reasons, students need to look at their lists and combine several details. They need to look for similar ideas that fit a common category. For example, the fast morning routine detail could be paired with a detail about the eliminating of arguments between parent and child over appropriate clothing.These both provide supporting evidence that uniforms decrease family stress. 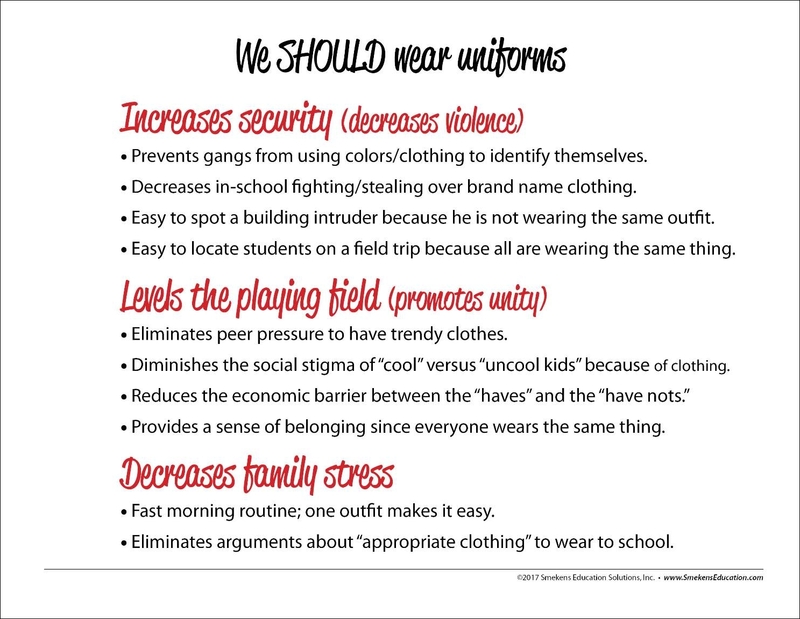 A second reason to wear uniforms is that they level the playing field among students. This is supported by the elimination of social and economic peer pressures. Additional details like: easily spotting kids on a field trip, preventing gangs from using clothes as markers, and spotting intruders in a building all help increase security and decrease violence. 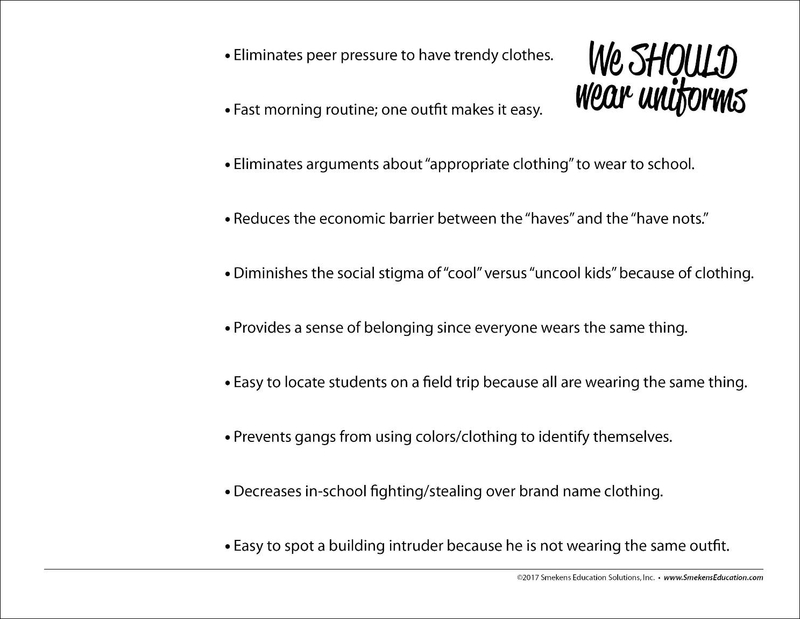 This would be a third reason in support of wearing school uniforms. In summary, a strong reason will produce an entire paragraph. It will include a broad statement that is followed by several specific supporting details. 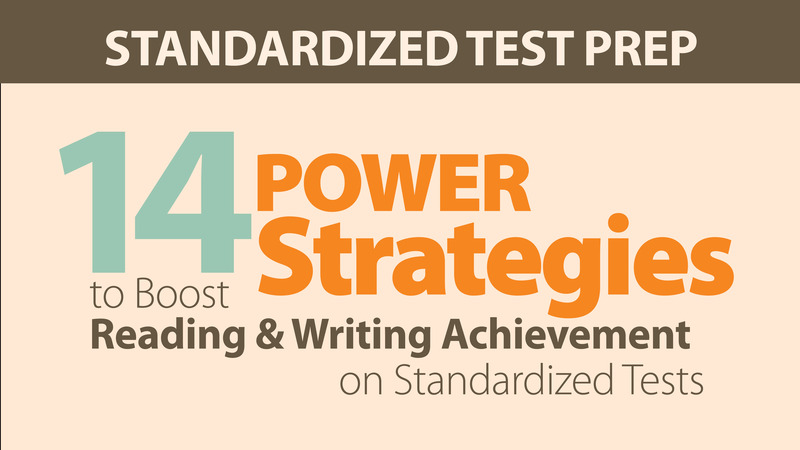 To achieve this, teachers need to first ask students to generate a list of details in support of a position. Then, they need to model how to cluster similar details to infer reasons. Generate a list of specific details in support of a position. Group related details into categories or reasons. Develop reasons with supporting-detail sentences. Stacey Rubin, middle school teacher at South Bend Hebrew Day School (South Bend, IN), shared how she helped her students sort and prioritize reasons. She provided this tangible sorting activity to prepare her students to write argumentative essays.